Still early days and a long way from a safe drug protocol, however we are learning how to convert white fat cells into brown fat cells. This is good news that should allow superior fat loss protocols that work safely to limit accumulation through exercise. It has been far too easy for the body to retain fat while also improving in fitness. At least we understand that conversion is possible and even inducible. In the meantime, we get to wait. Newswise — New York, NY (August 2, 2012) — Columbia University Medical Center (CUMC) researchers have identified a mechanism that can give energy-storing white fat some of the beneficial characteristics of energy-burning brown fat. The findings, based on studies of mice and of human fat tissue, could lead to new strategies for treating obesity and type 2 diabetes. The study was published today in the online edition of the journal Cell. 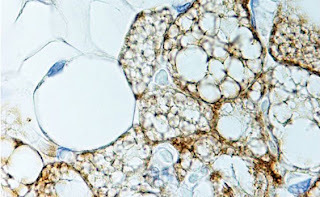 “Turning white fat into brown fat is an appealing therapeutic approach to staunching the obesity epidemic, but it has been difficult to do so in a safe and effective way,” said study leader Domenico Accili, MD, professor of Medicine and the Russell Berrie Foundation Professor at CUMC. White fat can be “browned” with a class of drugs called thiazolidazines (TZDs), which increase the body’s sensitivity to insulin. However, TZDs have many adverse effects — including liver toxicity, bone loss, and, ironically, weight gain — which have limited the use of these drugs. Scientists have known that TZDs promote the browning of white fat by activating a cell receptor called peroxisome proliferator-activated receptor–gamma (ppar-gamma), but the exact mechanism was not clear. To learn more, Dr. Accili and his colleagues studied a group of enzymes called sirtuins, which are thought to affect various biological processes, including metabolism. The researchers had previously shown in mice that when sirtuin activity increases, so does metabolic activity. In the present study, they found that sirtuins boost metabolism by promoting the browning of white fat. “When we sought to identify how sirtuins promote browning, we observed many similarities between the effect of sirtuins and that of TZDs,” said lead author Li Qiang, PhD, associate research scientist in Medicine at CUMC. Sirtuins work by severing the chemical bonds between acetyl groups and proteins, a process known as deacetylation. “So the next question was whether sirtuins remove acetyl groups from ppar-gamma and, indeed, that was what we found,” said Dr. Qiang. To confirm that the deacetylation of ppar-gamma is crucial to the browning of fat, the researchers created a mutant version of ppar-gamma, in effect mimicking the actions of sirtuins. The mutation promoted the development of brown fat–like qualities in white fat. This research was supported by grants from the National Institutes of Health (HL087123, DK58282, DK64773, DK063608, and RR024156). Upon its official opening in October 1998, the Naomi Berrie Diabetes Center at Columbia University Medical Center established a new standard of care for the 1.6 million people with diabetes in the New York area—combining world-class diabetes research and education programs with unprecedented family-oriented patient care. Named for the mother of the late Russell Berrie, founder of RUSS™ Toys, the center is today recognized as the most comprehensive diabetes research and treatment center in the tri-state region and has been designated a national “Diabetes Center of Excellence” – one of only three in the state of New York. Approximately one hundred faculty and students, affiliated with the Center, conduct basic and clinical research related to the pathogenesis and treatment of all forms of diabetes and its complications. For more information, visit www.nbdiabetes.org.